A new financial foundation for operations hinged as well on effective delivery of a second message — that all members of the W&M family must do their part, with no one standing on the sidelines. Those of us on campus — faculty and staff — have had to become more productive. We have cut some costs, slowed the rate of increase of others, moved funds from less important to more important uses and developed new means of earning revenue. This has not been a question of working harder; William & Mary people work very hard. It has been a matter of wiser allocation of resources, developing more efficient systems and finding new ways to make a buck, especially through online education (while remaining true to the superb caliber of education we have always provided our students). A new financial foundation has also been a matter of in-state students and their families shouldering more of what it costs to educate them. Our out-of-state students and their families have been doing this for many years. As tuition and fees have increased, we have also moved as quickly as feasible to increase our financial aid for those middle- and low-income students who lack the means to pay the costs of the exceptional education W&M provides. We are meeting the need of in-state students quite well, but we still lack sufficient resources to do the same for out-of-state students. Building the new financial foundation has also been a matter of alumni, parents and friends answering the call with greatly enhanced philanthropic support. To this end, one of our most telling efforts has been our For the Bold campaign. By December 2017, less than two years into the public phase of For the Bold, William & Mary had raised more than $738 million toward the $1 billion goal. Bucking the national trend, W&M has also continued to increase alumni participation annually. This year we set a new record, with 29.9 percent of undergraduate alumni giving to alma mater. That makes us No. 1 among nationally ranked public universities for undergraduate alumni participation, and No. 17 among all leading universities, public and private. We have much to celebrate on this score! And we have much to celebrate about dollars raised. Fiscal year 2017 was the second-largest fundraising year ever for William & Mary, with gifts totaling almost $135 million. It is also the fifth consecutive year that we’ve broken the $100 million mark. We have been fortunate over the last year to announce gifts that are funding the new Shenkman Jewish Center, a greatly expanded Alumni House, scholarships for undergraduate, graduate and professional students and a wide swath of research programs on and off campus, among other efforts. People are at the heart of For the Bold. Scholarships support is our top priority, as we seek to ensure that students of great promise can afford to attend William & Mary, while also enabling the university to compete effectively with peer institutions for very able students from families with limited means. 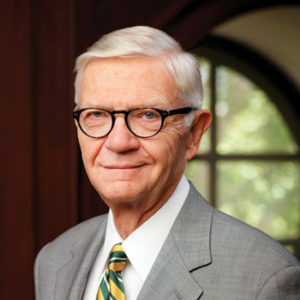 William & Mary’s aggregate endowment from all sources was $580 million in June 2008 and an estimated $899 million in June 2017, with more than $313 million also committed but not yet received (largely in estates). While our endowment is stronger than at any other time in William & Mary’s long history, we seriously lag behind other leading universities. Looking at data from fiscal year 2016 (the most recent year available), all other such universities, from Georgetown to UCLA, had endowments well above $1 billion (most are north of $3 billion). The University of Virginia’s endowment was roughly $6 billion. Most leading universities have much larger student bodies than W&M, so they are not an accurate comparison. Princeton and Dartmouth, however, have slightly smaller student bodies than W&M. Princeton’s endowment in 2016 was about $22 billion and Dartmouth’s almost $4.5 billion. These numbers underscore the importance of endowments in providing a critical foundation for stability and prestige. No matter the comparison group, William & Mary is grossly under-endowed. We do remarkably more with strikingly less. The shoestring is very tightly pulled. It is past time that we become able to do more with more. W&M has become a significant research, graduate and professional university as well as a great teaching college for undergraduates, with heavy emphasis on professors knowing students by name, engaging them in and out of the class and involving them in serious research. W&M’s model of marvelous teaching, learning and research costs a lot to sustain and even more to move forward in response to evolving opportunities. Maintaining our low student-to-faculty ratio is expensive; providing faculty with time and resources for research is expensive; involving undergraduates in serious research is expensive; sustaining first-rate graduate and professional programs is expensive. So, too, is providing sufficient financial aid to families of modest financial means. Since the W&M Promise was adopted in April 2013, the average net price for Virginia families with need making less than $75,000 annually has dropped by more than 20 percent at William & Mary. Among Virginia’s public universities, W&M offers the lowest net price for those students. We are also the only public university in Virginia to replace all loans with grants for in-state students with annual family incomes under $40,000. We are now meeting the entire financial need for Virginia students. These efforts are making a difference. William & Mary was recently recognized by the New York Times as being among the nation’s colleges and universities most committed to access and affordability and the leading public university in Virginia. And this fall, we saw a 20 percent increase in entering Pell-eligible freshman and transfer students, mostly from Virginia. Our number of out-of-state Pell-eligible students remains low because we lack the means to provide adequate out-of-state aid. If William & Mary is to make steady progress in the socioeconomic diversity of campus, we must succeed in our efforts to grow our endowments for scholarships. These scholarships are needed as well for middle-income families from outside Virginia. The cost of attending William & Mary invariably exceeds their families’ capacity to pay without more aid than we are now able to provide. Overall, 2016-17 was an excellent year for William & Mary financially, with marvelous support from all parts of the W&M family – alumni, parents, faculty, staff and students. We are making significant progress in building a new financial foundation for William & Mary’s operating budgets. We are moving forward on crucial parallel paths: campus productivity, realistic levels of in-state and out-of-state tuition coupled with need-based financial aid, and a powerful mix of philanthropic support from our alumni, parents and friends. While an enormous amount remains to be done, we are rolling with a clear sense of where we’re headed and how to get there.